Mark Hudson (the main sponsor of the Seve Trophy) is out on Monday June 4th and can bring out some skycaddie rangefinders at a special price for members. If ordered off his website (http://www.golfdealers.co.uk) they will cost more. The information on the product is attached. These are big discounts on retail prices – the new SGX is £230 in UK (about 275 euros at current exchange rates). He flies out Monday morning and these prices only apply to ones he brings out with him, so orders need to be in early. The Nicklaus team must have been impressed with the result of their vision…………….. 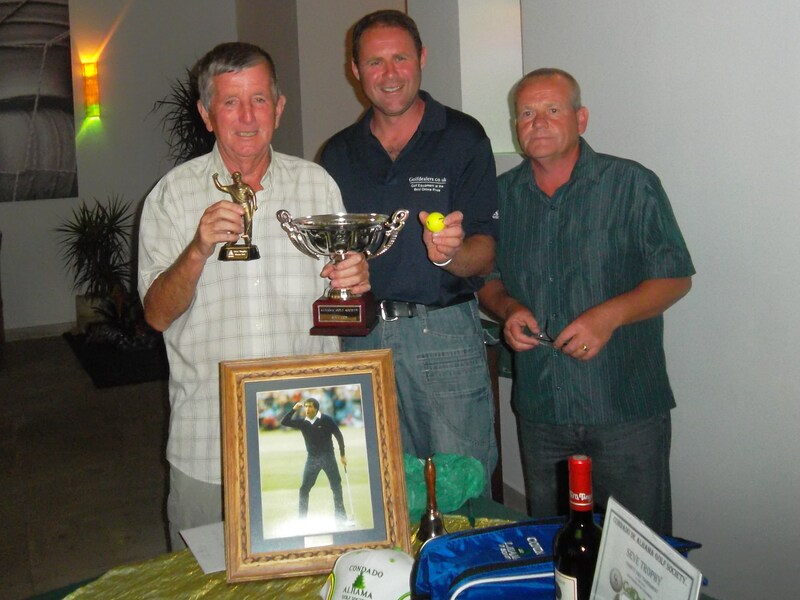 This week was the return of the Apollo Air sponsored monthly individual stableford. Summer has certainly arrived with baking-hot temperatures and no wind at all for most of the field. The course was in fantastic condition due to the visit on Thursday of the course architects from the USA. Alex and his team have been working all hours (starting work at 4 am on Friday!) to impress the Nicklaus team. I did go to the 1st tee at the scheduled 11 am tee off time to take a photo but not all the visitors had arrived and so I was unable to do so. I am still awaiting feedback from global golf, but Alex is now in the U.S. so I will have to speak to him later. The course was stretched with tees as far back as they could go, and many pin positions were difficult to get at. This did not stop several of the 35 players breaking par though. Work is progressing well on the temporary clubhouse with the building now erected and fittings going in, and surrounding land being levelled for a terrace. Also there is some unusual activity around the mound which was earmarked for the permanent clubhouse. Bulldozers and diggers have been adding landfill around the front of it, but I have no idea what the work is for. 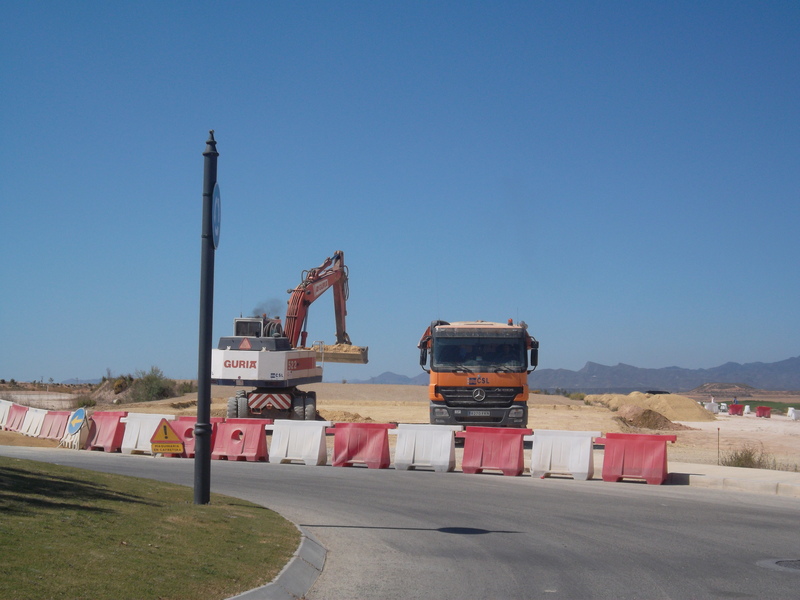 A lot of activity at the entrance to the permanent clubhouse site……………..
Next week is a modified bogey competition where players play a stableford and each hole is plus or minus to par. Holiday season has started with spring bank holiday week next weekend followed by the queen’s jubilee celebrations the week after. 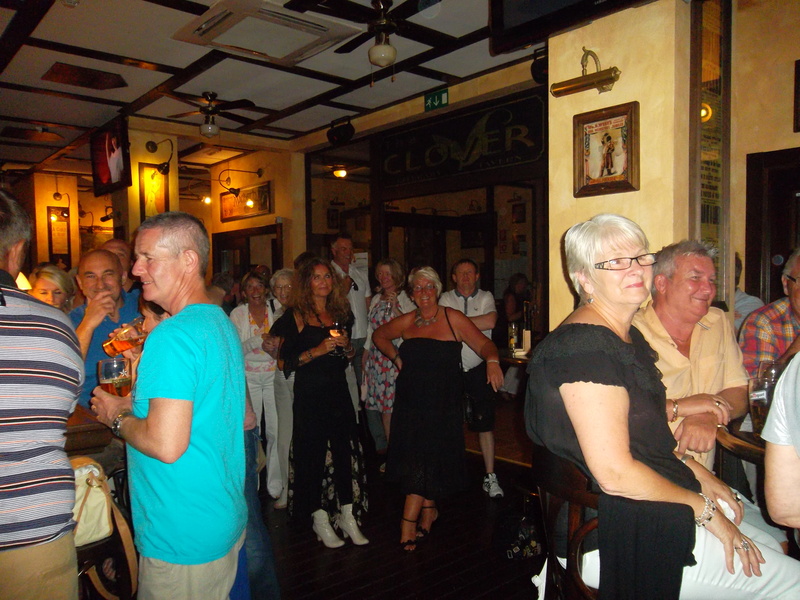 Last year’s Viking Cup celebrations at Trevi’s was a great success with nearly a 100 partygoers……………. I have now booked accomodation for the Benidorm trip in October. Early booking was required to get us all in the same hotel and we have 18 members and wives going. 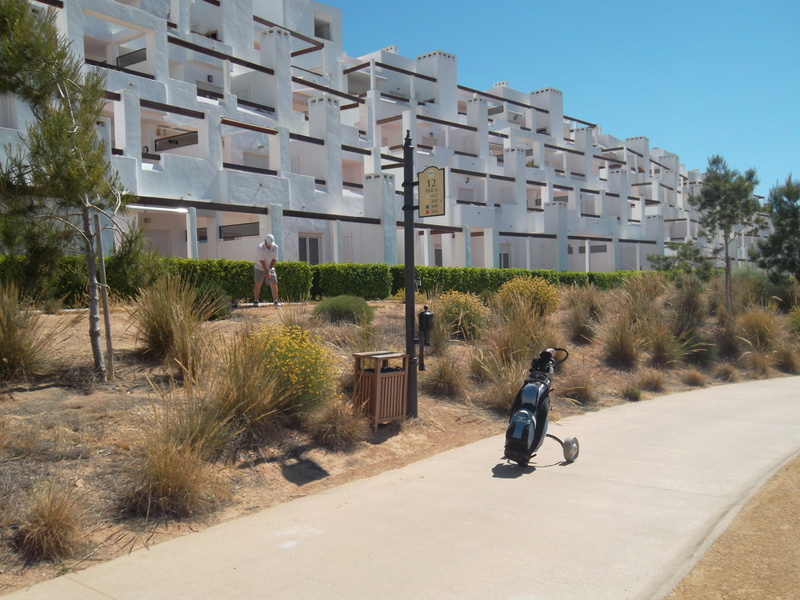 I know it seems a long way away, but I am now in the process of booking accomodation for our Benidorm golf trip at the end of October. As we need at least 8 rooms at the moment we need to book early to make sure we are all together, and avoid price hikes with late booking. 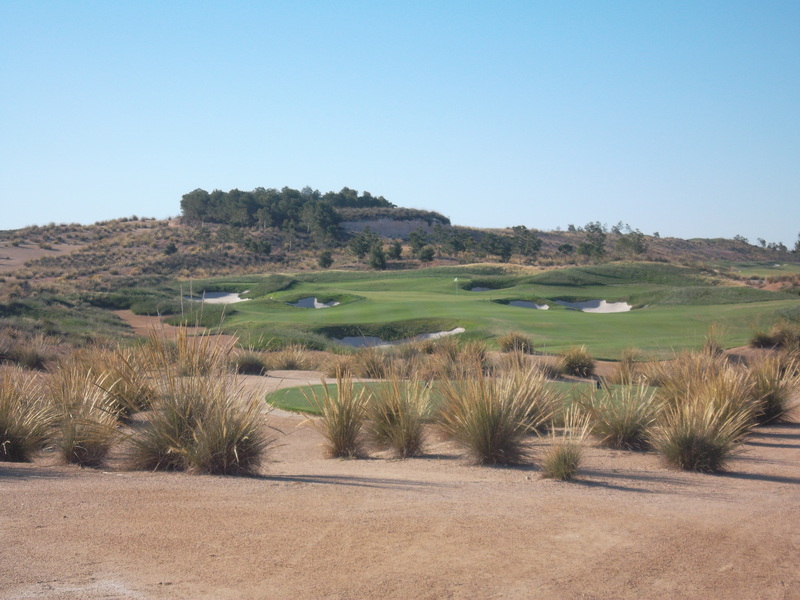 The trip is for 2 nights/3 days from Monday to Wednesday with golf at the superb Villataina course in Benidorm for those who wish to play. 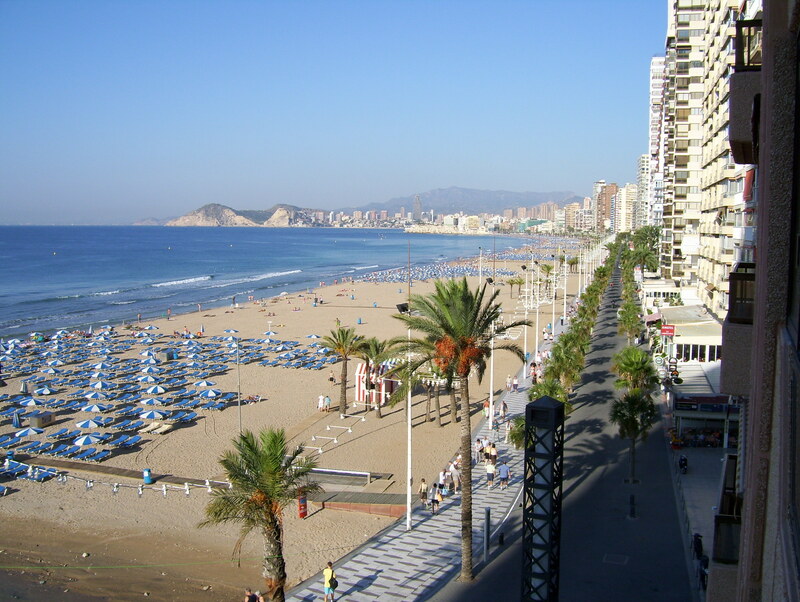 There are a couple of possible hotels in mind which range from 2 star basic accomodation to 4 star luxury in the Old Town area of Benidorm. Price for 2 nights half board for 2 people range from £70 – £110. Golf last year was 60 euros (without buggy). If you are interested please let me know in the next few days (barry@cdagolf.com) – we get discount for a group booking but later bookings will be without discount. 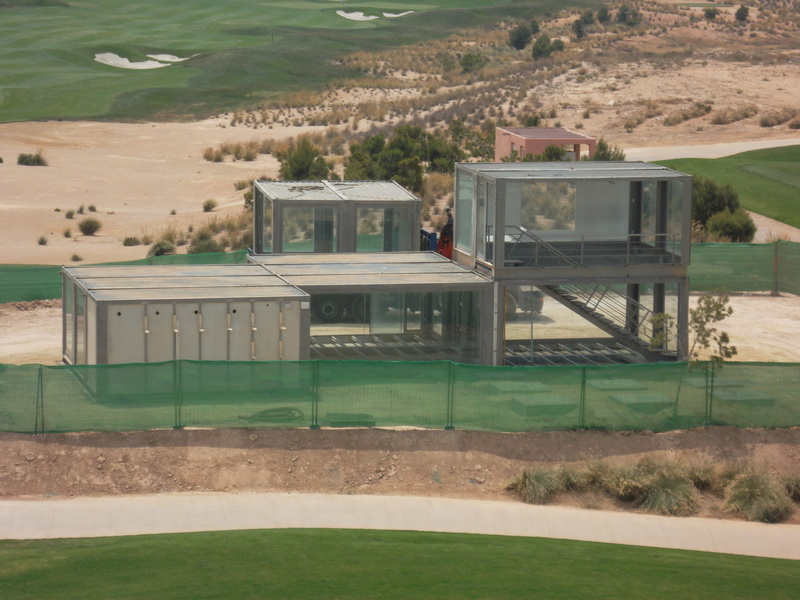 temporary clubhouse viewed from penthouse 7…………………….. 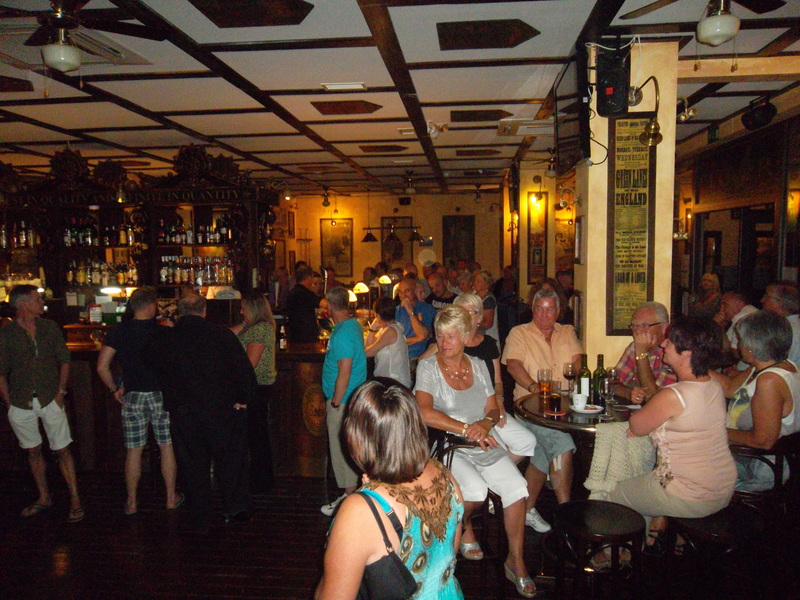 The Benidorm trip will be October 29th to 31st (2 nights) with golf on the 30th at Villataina (Benidorm). Anyone wishing to stay for one night only can be accomodated. Accomodation has not been confirmed yet but it should be between 50-65 euros a night per double room half board in the Old Town area. Golf was 60 euros last year (no buggy). Contact me at barry@cdagolf.com if you are interested. We intend to book early as prices went up last year nearer to the date. This date has been selected as it follows the Viking Cup so hopefully some scandinavians will want to join us. Presidents Day is fast approaching (Friday June 8th). 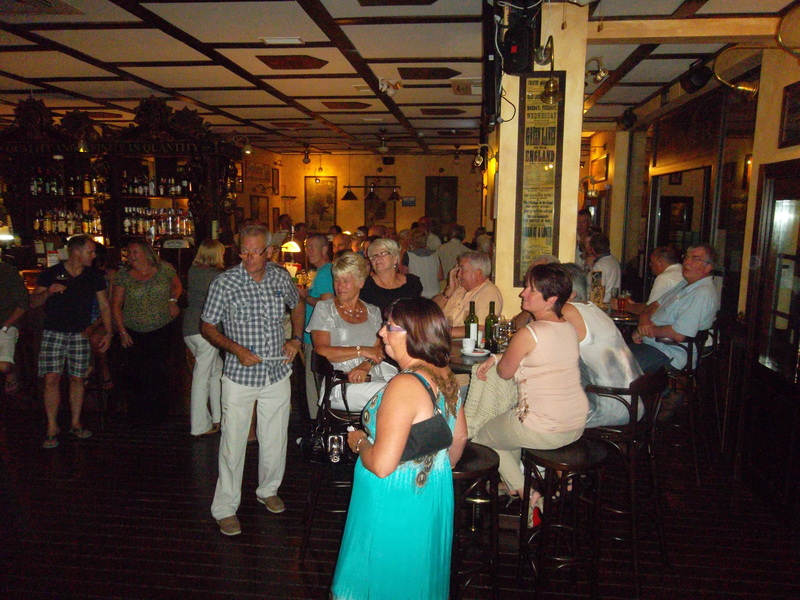 The evening presentation will be at Trevis restaurant in Camposol. We have already had 2 great nights there and the hot/cold buffet is the best around. The price for this has not been finalised but transport will be available if needed. Work is progressing well on the temporary clubhouse. Part of it is already erected, and electric & water is being laid to the site. 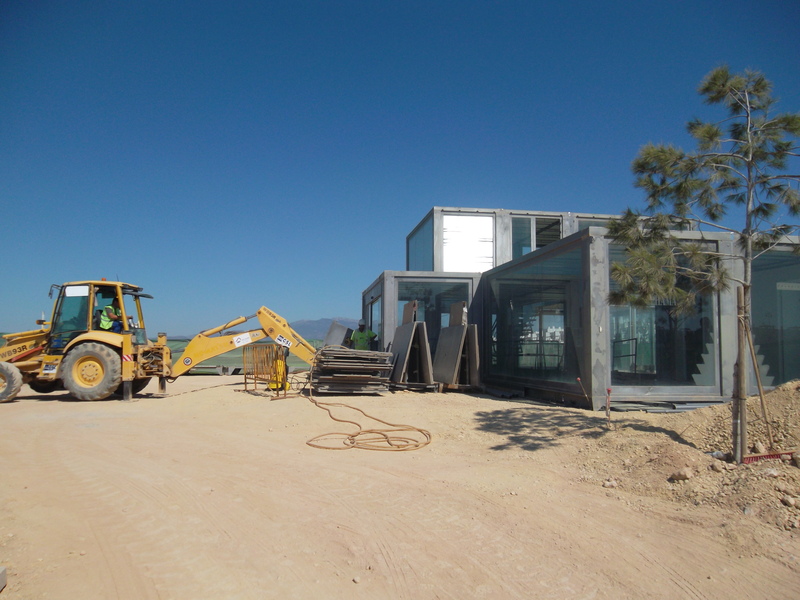 Completion date will be when they are finished! A couple of VIP’s will be playing the course on Thursday – 2 of the architects of the course from Nicklaus Golf will be here to try out their vision. The lakes are low at the moment and rain is needed. As they are low the staff have taken the opportunity to empty the lake on the 13th in order to carry out essential repairs. This has been completed. Then the priority will be to fill the lake between 9 and 18, followed by 4. Course irrigation is provided from these lakes and at the moment there is sufficient to serve this need. Committee Meeting 1st May 2012. & Welcome to Paul Briggs – Vice Captain 2012. Seve Trophy and various other Seve events, all progressing well. Global Golf – Luke, Meeting next week. Agreed to avoid further problems it would go back to being informal. Players to go off at the time they signed up for on the form. 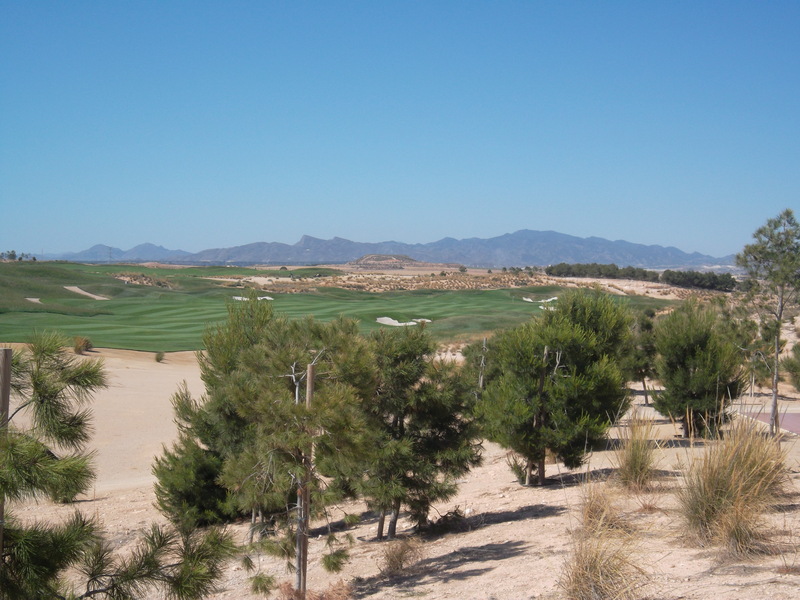 Mar Menor return – Graham to organise team events. 3rd, 4th or 5th September Mon or Wed.
Will try for 11th, book 6 tee off times. Aguillon – 0ffer is for 20€. Possibly July – Kevin to sort. 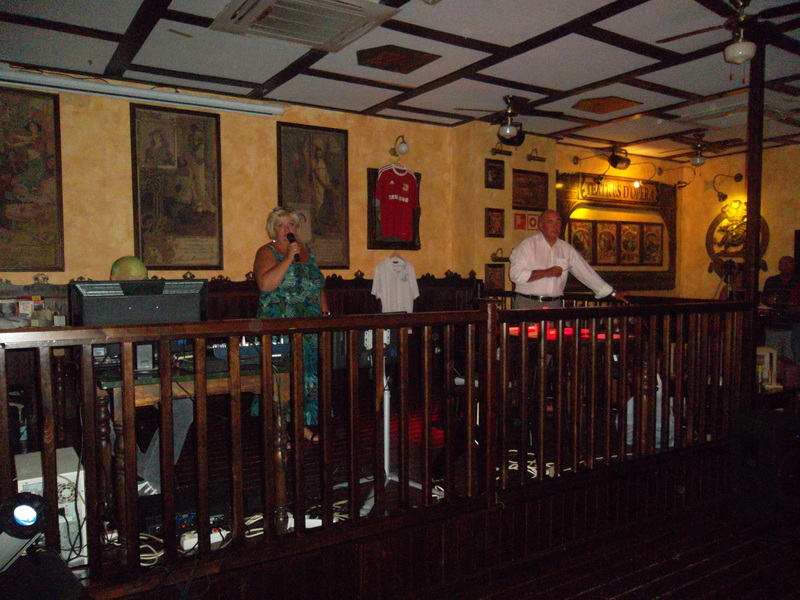 Benidorm – Early November, for two nights – Barry to sort. Global Golf Green Fee Vouchers – to be used for major competitions and monthly members draw for 2 vouchers. St Patricks Day competition has been adopted by the society as a major. It will be played on March 17th each year. The totals are just in with some minor items to be added. What a fantastic effort from the organisers, sponsors and everyone who supported the event by putting their hand in their pocket. Our 1st aim was 500, then 1500, then 2000…. it just kept increasing exponentially. Now we need to contack the Seve foundation to arrange to hand the money over. Thanks to Ken and Alicia Saunders whose idea it initially was. Fed up waiting for a bar over the 18th green so I opened my own…..1 euro a can…………. The golf day went off without a hitch with all 60 players turning up (300 euros for Seve), and the weather was superb, although a touch hot for the later starters. The greenkeepers had done a fantastic job in the last two days, cutting the greens and fairways so the course was presented immaculately. Thursday night Kev & Graham went out placing sponsors advertising on each of the tees, and Paul & Jim selected a putt for the putting green competition. Brian performed his usual exemplary role as starter, collecting entry and membership fees for over 2 hours. 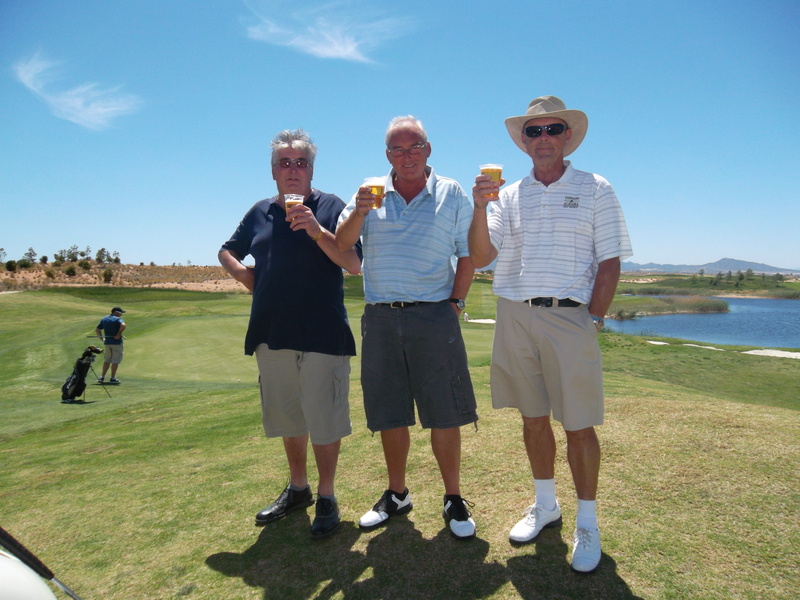 Dave & Kim donated a bottle of water for each player on the 1st tee, and on the 12th tee Sue, Jean and Lesley sold beer, water and soft drinks at 1 euro. What was left I took to the 18th and thirsty players donated even more money. This raised a total of 75 euros, a great effort girls! Ray (under his sunshade) manned the 11th green noting any balls hitting the green and 2’s being scored. 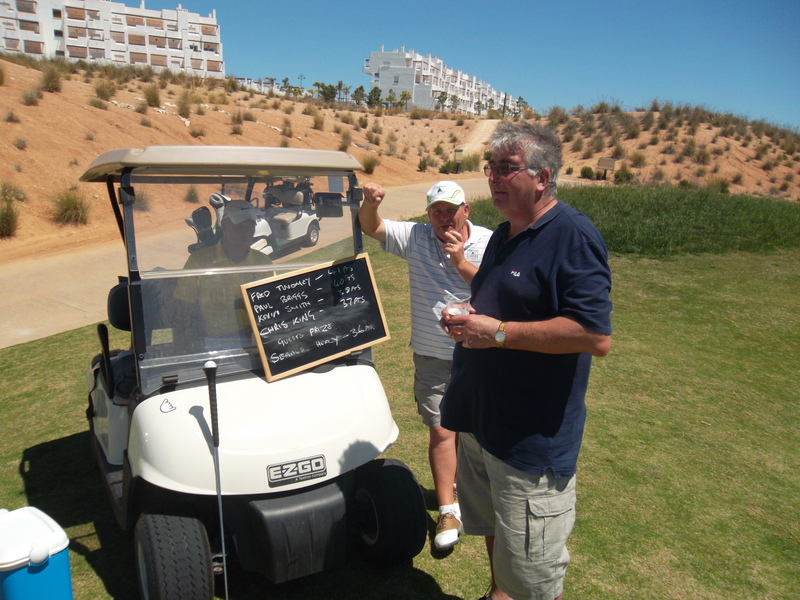 (Ken & Alicia donated 1 euro for each ball on the green, 2 euros for a birdie and 100 euros for a hole in one. On the 18th myself and Graham collected scorecards, checked for 2’s and passed the results to Kev who updated the leader board for all to see. Kev and Cath arrived early at the Clover and Bulgarian to set up the prize tables, and Kev Kev did a great job as master of ceremonies at his 1st major event as captain. 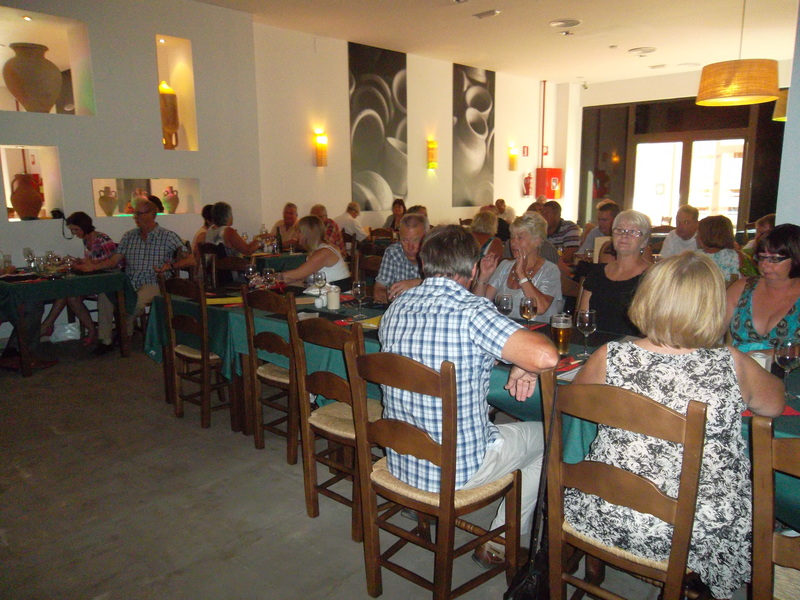 About 60 people stayed for a meal although there were more there at 7.30pm to see Fred collect his prizes. After the meal (which was excellent) we all moved next door to the disco in the Clover, where the Seve DVD had been playing all day. During the 1st break the long-awaited auction began. Jill put a live stream online so members back home could view the proceedings. Lynn proved to be an inspired choice as auctioneer, controlling some of the noisier visitors at the back and encouraging the audience into bids. Brian was an able assistant at her side, and Kev, Graham and Helen went out into the crowd to collect information from successful bidders. 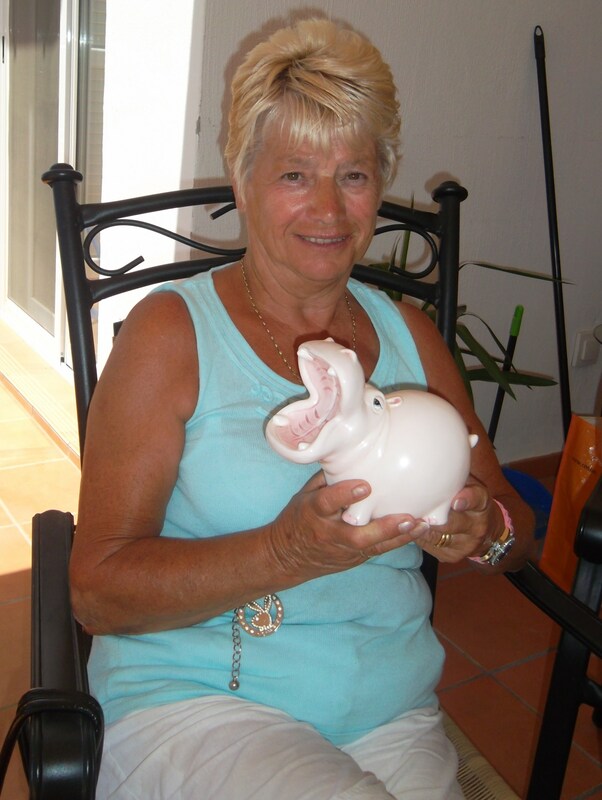 Cath and Phil managed the collection of money. 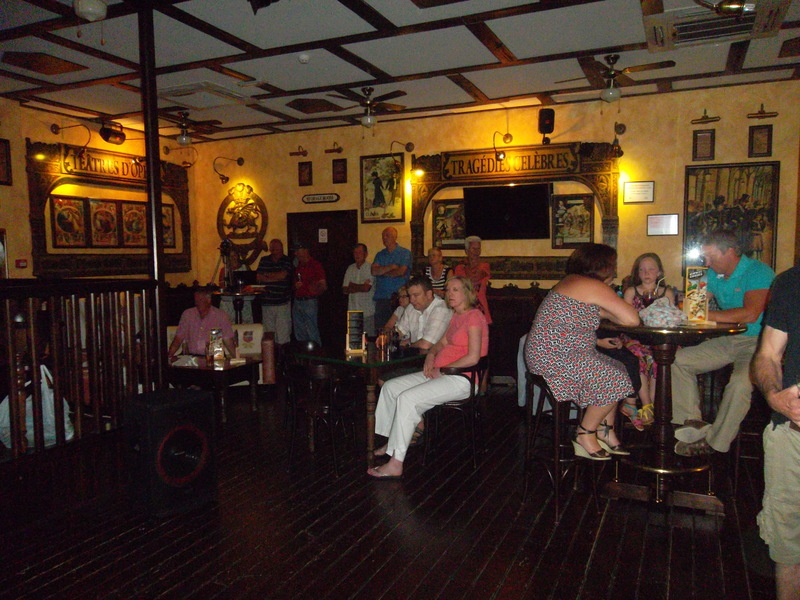 It turned into a fantastic money aising exercise ranging from 10 euros for the cheapest item to 200 euros for the holiday villa in Florida. 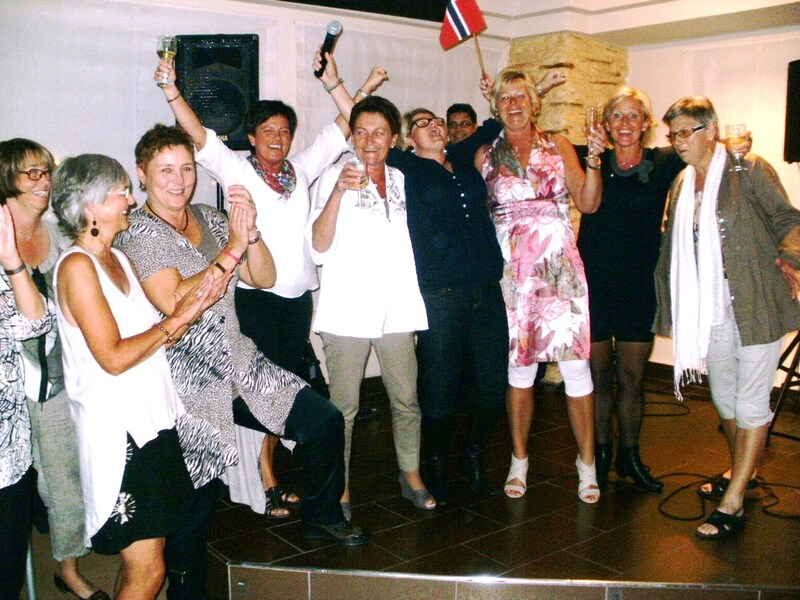 1400 euros were raised through the auction. So many people have contributed over the last 8 weeks but special mentions must go to Brian, Cath and Kevin who have taken the lead in rallying the community. Kev was on the leader board but this was his 2nd shot on the 12th. His drive hit the blue tee box on front of him and bounced sideways to penthouse 11, stopping inches from the out of bounds. Paul Briggs was 1st to hit the green on 11 and no wonder he finished 2nd with such a perfect swing…………….. 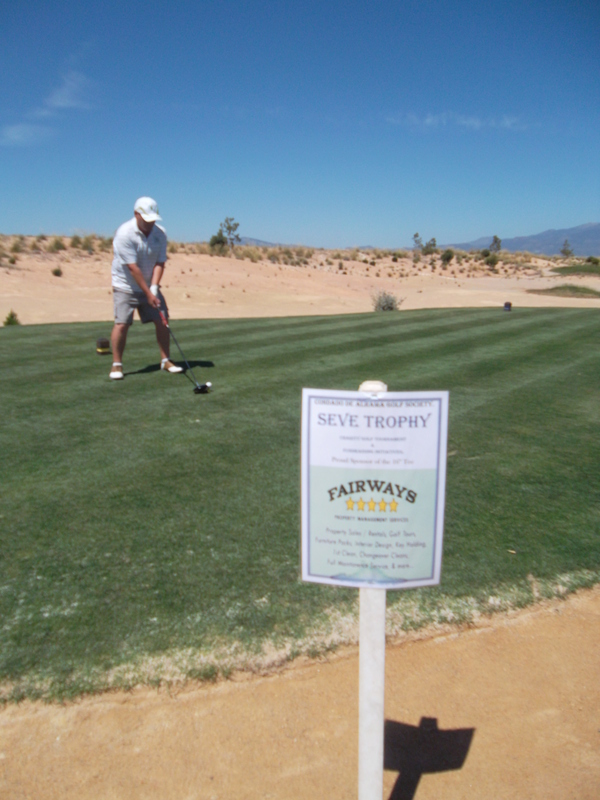 Thanks to all the sponsors…….this one is Fairways on the 16th…………….. 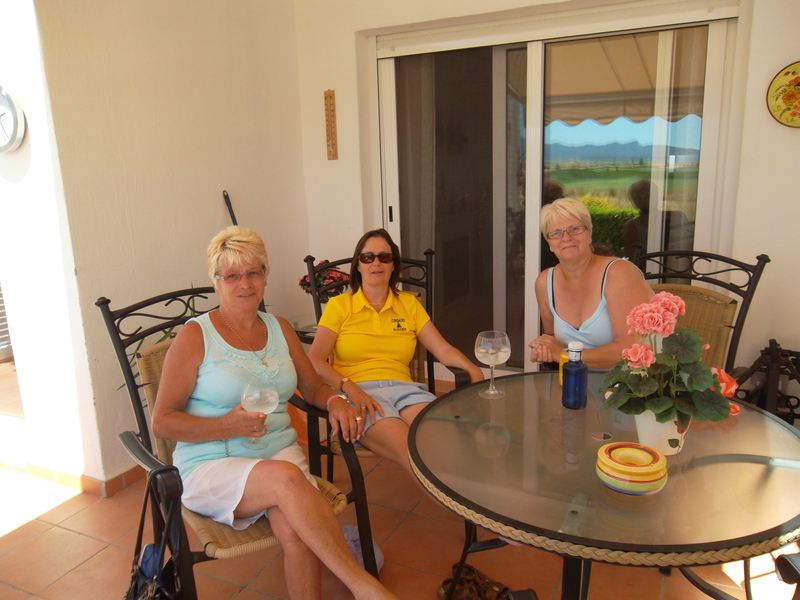 The girls relax after their stint on the 12th………….. 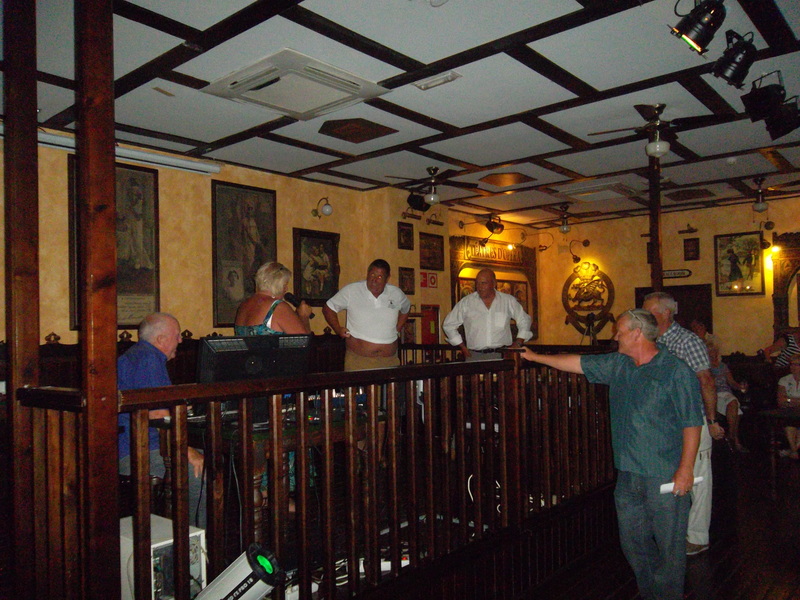 Plenty stopped for the meal in the Bulgarian……………..
a full bar for the auction……………….